CULVER CITY, Calif., July 11, 2007 – Sony Computer Entertainment America Inc. (SCEA) held its annual press conference today at the E3 Media and Business Summit, making a series of announcements that demonstrated the strength and innovation of the PlayStation family of products. Among these announcements was the introduction of a newly updated PSP (PlayStation Portable) and an extensive library of soon-to-be released games and services across the entire PlayStation portfolio. The company also unveiled several new exclusive game development agreements with various well-known publishers including NCsoft Corporation , Midway, Ubisoft, LucasArts and Konami. The press conference was held in both the physical and virtual worlds whereby company executives presented in person and as their own personalized avatars within the PlayStation Home environment, transitioning from their virtual-world avatars to reappear live on stage. This format was designed to illustrate the innovative functionality of the innovative experience of PlayStation Home, the PLAYSTATION Network service designed to serve as a 3D community gathering place for PS3 users from around the world. 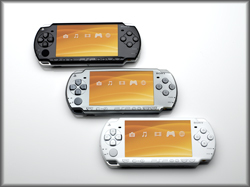 The new PSP is a sleeker and more streamlined version of the popular original PSP system. It is 33 percent lighter and 19 percent slimmer than the current version, making the all-in-one mobile entertainment system even more convenient to carry around at less than 1/2-pound in weight and less than 3/4-inch in thickness. The new PSP system will also have a thinner, more efficient battery, 64MB of system memory and video-out capabilities allowing consumers to enjoy their games at 480 x 272 resolution and movies at full standard-definition resolution on any progressive scan TV. In addition to the “Piano Black” model launching in September in the Core Pack, the new PSP will also be available in two new limited edition colors in North America: A collector’s edition “Ice Silver” PSP will be included in the Daxter PSP Entertainment Pack in September; and a limited edition “Ceramic White” PSP, including a Darth Vader silk screen on the unit, will be featured in the Star Wars Battlefront PSP Entertainment Pack launching in October. SCEA plans to make more than 140 new software titles available this fiscal year for PSP, in addition to the other great entertainment content coming on UMD ( Universal Media Disc ). Throughout the holiday and this fiscal year, SCEA and its third-party partners plan to release more than 120 PS3 software titles available on Blu-ray Disc (BD) , SCEA is also working on another 40 games and game packs downloadable via PLAYSTATION Network in North America. During the press event, the company highlighted several of its 15 exclusive first-party PS3 titles which are sure to excite gamers this holiday season – each of them taking full advantage of PS3’s powerful Cell Broadband Engine (Cell/B.E.) including Heavenly Sword , Ratchet and Clank Future: Tools of Destruction and Uncharted: Drake’s Fortune . Also showcased were expected second- and third-generation titles including Killzone 2, an earth-shattering futuristic action/combat game, the super-hero adventure InFamous and Grand Turismo 5 Prologue, the latest offering from the best-selling racing game of all time. SCEA also announced new games and services for its PLAYSTATION Network. Included were new features for the innovative and highly-anticipated service PlayStation Home, such as the ability for users to launch games from within PlayStation Home; a newly designed Home Square that replaces the original lobby concept; and four new personal spaces allowing for increased user personalization. Additionally, several new downloadable games were introduced specifically for PLAYSTATION Network, including a crafty puzzle game, echochrome, which utilizes PS3’s SIXAXIS wireless controller; an achingly funny action game named PAIN; and the next chapter in the popular Wipeout racing series, Wipeout HD. Also, demonstrated was a pair of games to be made available through download from PLAYSTATION Store and on BD: SOCOM: U.S. Navy Seals Confrontation, the next title in line of one of the most popular franchises in PlayStation history; and Warhawk, a ground-breaking online multi-player air and land combat game. The popular PlayStation 2 was also center stage as the company highlighted some of the more than 160 games headed to the platform this year in North America, including social game franchises, such as Buzz! and SingStar, both of which are already million-sellers in Europe and will make a huge impact on PlayStation 2 this year here in the US. Today’s press conference announcements follow Sunday’s news of a new PS3 80GB model coming to North America and new pricing for the current 60GB model. 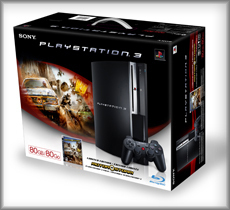 Beginning in August, the new 80GB PS3 will be available for a suggested retail price of $599 and will be sold with the popular online-enabled racing game MotorStorm . With the expanded hard disk drive (HDD), consumers will be able to download even more games and entertainment content from PLAYSTATION Network. Additionally, new pricing was announced for the current 60GB PS3 model. Effective immediately, consumers in North America can purchase the model for $499, $100 less than the original price.